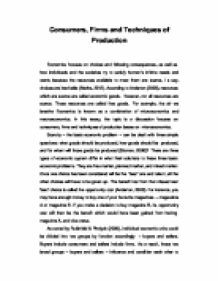 Consumers, Firms and Techniques of Production - making economic choices. Consumers, Firms and Techniques of Production Economics focuses on choices and following consequences, as well as how individuals and the societies try to satisfy human's infinite needs and wants because the resources available to meet them are scarce, is say, choices are inevitable (Marks, 2012). According to Anderton (2008), resources which are scarce are called economic goods. However, not all resources are scarce. Those resources are called free goods. For example, the air we breathe Economics is known as a combination of microeconomics and macroeconomics. 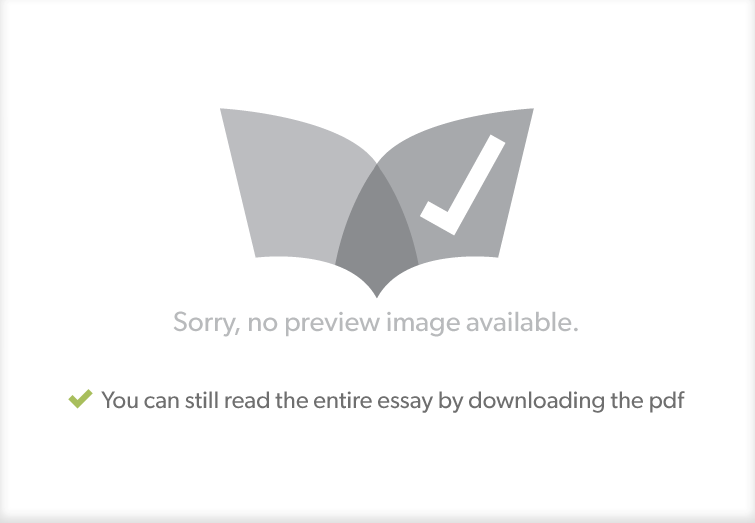 In this essay, the topic is a discussion focuses on consumers, firms and techniques of production bases on microeconomics. Scarcity - the basic economic problem - can be dealt with three simple questions: what goods should be produced, how goods should be produced, and for whom will those goods be produced (Sloman, 2006)? There are three types of economic system differ in what their solutions to these three basic economic problems. They are free market, planned market, and mixed market. Once one choice has been considered will be the 'best' one and take it, all the other choices will have to be given up. ...read more. Thus, the opportunity cost of these 60 units of orange is 25 units (100 units - 75 units) of apple. The 75 units of orange have a lower opportunity cost: 15 units of apple. If the economy produces oranges only, the opportunity cost of the 100 units of orange goes to 60 units of apple. Figure 2. The production possibility frontier and opportunity cost Figure 3. Efficiency on the production possibility frontier Every point shown in Figure 3 is efficient combinations of apples and oranges. In spite of A have 100 units of apple and no oranges, it is still efficient due to all resources are utilised. Figure 4. Inefficiency on the production possibility frontier In Figure 4, none of those points is efficient. Generally speaking, any points within the curve are inefficient. The reason is, there are also available resources have not been used (Threadgould & Meachen, 2008). Figure 5. Shifts in the production possibility frontier Points outside the curve are unlikely to be achieved by given current resources, but they are not cannot be reached forever. In Figure 5, if point A wants to shift to point B, it needs economic growth to increase available resources, and improvement in technology or increased skilled (Threadgould & Meachen, 2008). ...read more. Owing to the concept of demand, there are several reasons to influence on demand, such as income, prices of other goods, advertising and changes in tastes. Threadgould & Meachen (2008) declared that, the higher the income, the higher the demand for normal goods. Normally, a good, for example, A, has substitutes and complements. A substitute, assumed as B, means a good can be used instead of A, such as Pepsi and Coca-Cola. If the price of B increases, the demand curve of A will shift to the right. A complement, assumed as C, means a good should be used with A, for instance, DVDs and DVD players. If the price of C increases, the demand curve of A will shift to the left because these two goods should be consumed together. According to Rubinfeld & Pindyck (2009), supply is the quantity of goods that supplier are willing to sell at a given price. In a supply curve, inward shifts are occurred by non-price determinants, such as indirect taxation, costs of production and producer cartels. Outward shifts are caused by the development of new technology and subsidies. See Figure 10. Figure 10. Shifts of the supply curve In a brief, microeconomics presents an inter-relationship between buyers and sellers, consumers and firms, demand and supply, quantity and quality. ...read more. The lower investment becomes, the less long term employment there is available. Inflation also interrupts the balance of payments. If inflation is greater in the UK than other countries and the value of Sterling on the currency markets remains the same, exports will be less competitive and imports will become more competitive. But over the planning period, the importance has shifted from primary sector to the tertiary sector which has helped for a faster growth of Indian Economy. 4.Full Employment/Reduced Employment: Generally a person who is not gainfully employed in any productive activity is called unemployed.